Appalachian Home Inspections LLC provides professional mold inspections for properties located throughout the North Central West Virginia region. If you suspect that your home or a home that you are considering buying has mold present, let Dale Shockey assist you. If air quality is a concern, the culprit may be a hidden, ongoing mold infestation. Many wonder why they should worry about mold. There are many aesthetic and health concerns related to the presence of mold within living quarters. Some of the health-related issues that may indicate a mold problem include unexplained sneezing, coughing, headaches, wheezing, eye and skin irritation, and similar symptoms in sensitive individuals. Individuals with compromised immune systems, asthma, or obstructive lung diseases may develop serious infections when exposed to mold on a regular basis. Many inhabitants may have no symptoms at all, yet their health is still being impacted. Molds naturally occur throughout the environment. They can be found everywhere, both outside and inside; however, they will only develop into excessive, harmful growths in the presence of moist or humid conditions. Outdoors, molds have an important role in nature, as they help break down non-living organic matter (fallen leaves, trees, etc.). Indoors, no amount of mold growth is acceptable or safe. Some types of molds are toxic and can cause neurological issues and death. Molds reproduce by producing tiny spores that are invisible to the naked eye. These spores float through outdoor and indoor air, and may be carried inside on clothing, as well. 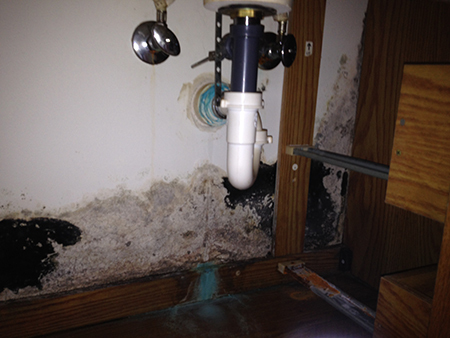 Mold will only grow indoors when the spores land on damp or wet surfaces. It is not possible to completely eliminate all mold and mold spores indoors, as they even travel on house dust; however, their growth can be prevented. Mold spores simply will not grow without the presence of moisture. The best way to control mold growth indoors is to prevent the humidity level from exceeding 60%. Dehumidifiers and air conditioning units are helpful. If an underlying leak is present, it must be corrected. If mold growth is already present in your home, the cause must be identified and corrected. Then, the mold must be eliminated. If the area affected is small and non-porous, specially formulated mold killing agents may be helpful. Please note that bleach is no longer recommended for killing mold, as it contains over 90% water and may actually make the issue worse. Widespread areas of mold growth may require professional mold removal. If you believe you may have mold issues in your home, call Dale Shockey of Appalachian Home Inspections LLC today at: (304) 614-0636 to schedule a mold inspection.